I’m so excited to show you this solar powered modified Tumbleweed Epu tiny house on wheels. As you can tell it’s been slightly modified. First with the barn style roof, different sized windows, larger front door and open porch. If you study the Epu plans real quick you’ll notice that the interior was left almost the same. They just changed a few things a little here and there but the layout is basically the same. World’s Most Visited Tiny House on Wheels? This little house is actually very popular. It might even hold the record for most visitors because it’s home to the Solar Living Institute in Northern California which gets approximately 200,000 visitors a year! And It’s Also Been Lived In Full Time? And you’ll be glad to know that Ross Beck, of The Solar Living Institute, lived in the home 5 days a week for two years while he was the Executive Director for the institute. During that time his house was 75 miles away from the new office. So he was able to save all of that time commuting. Meanwhile, he got to learn a lot about living with less. Here’s just some of what he had to say about that. More photos and info on this micro barn home on wheels over here at the original post. Want to build your own Epu house? Get the plans here. Can’t get enough tiny houses? Join our free daily newsletter! You’ll love it. Have to move the ladder to use the sink? No. That ladder is waiting to injure somebody. And once again this is a design only for the young and agile. Well- they keep saying this is a Tumbleweeds design but it sure looks like my solar barn design I designed and published in 2009 before Tumbleweeds. Either way this is a good design and the solar panels can be attached to the roof so you don’t need a pole mount system. I included two lofts on either end in my design and a side entrance for more room. I will be including the plans in my new book “Ten Tiny Cabins” to be released in 2014. I must say, that Tiny Houses are now in competition with the Mansions on the block. Tiny Houses are really beginning to jazz themselves up. I would love to see Tiny Houses for everyone (i.e. senior and disabilities), also I would love to see more Tiny Houses Communities. Another factor, Tiny Houses are now in competition with apartment complexes; in which, some newly built apartment complexes are trying to pattern themselves accordingly with Tiny Houses. Alex, I must add your blog has become more sophisticated, next we will see it in the Space Age, even though it is down to earth. Where is this happening? So many areas are not zoned for tiny houses. 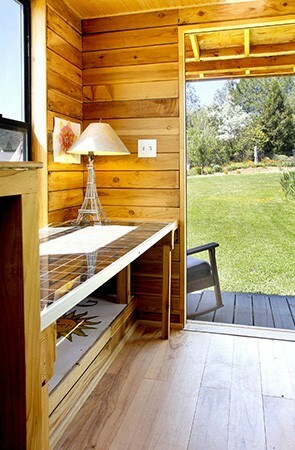 I adore the cladding of this tiny house. It’s exactly the look I am going for. Not only is it aesthetically appealing but it is non-combustable, making it effective in areas with a high threat of bushfires. Designs should accommodate every lifestyle, such as a loft for the young and a daybed or sofa bed for the elderly or injured. Hey I love the look to this, really nice interior as well. How much did the barn itself cost? Looking at the expenses for a tiny home this size. Any tips for someone interested in buying a tiny home? Next post: How this Guy Created an 8 Room Micro Apartment with 182 Sq. Ft.